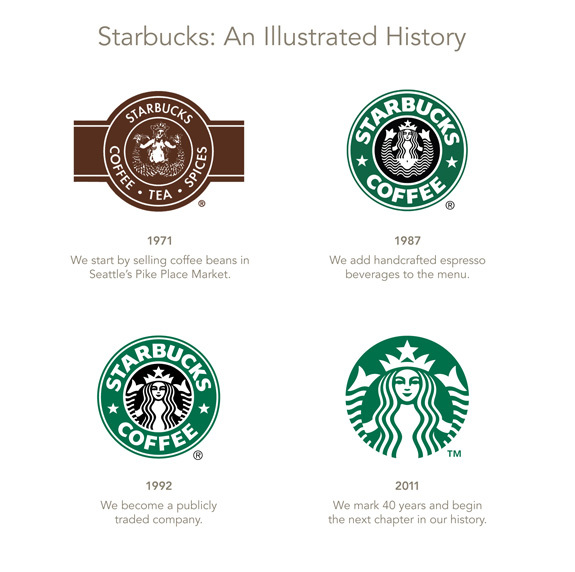 “The best days of Starbucks are ahead of us.” So gushes the seemingly undercaffeinated Starbucks CEO Howard Schultz in the company’s announcement of the unveiling of their new logo. Like the MTV logo last year, it’s not much more than a crop job. The name that explained who the company is can now be excluded. The message: if you have to ask, you’re hopelessly backward. Here are my predictions for future Starbucks logos. Study them while you can. Hilarious! Almost begs to have a follow-up about all of the copycats and where they would be down the road. I think a well-designed logo should lose value if you add or remove elements from it. By 2043 – it looks like they’ve merged with TBS. Funny – Very Funny…and Caffeinated! Markets change. What might have been a well-designed logo in the past sometimes needs an update to reflect this/reposition brand with new realities. In general I see nothing wrong with this if the risk of alienating existing brand value is avoided. Reed, I suppose I should’ve done a post putting other logos through the same process. Would the Kraft logo be “RAF”? Feel free to run with it! Very funny! I am not a fan of the new logo; to me the middle part is the least important. They dropped what I recognized as Starbucks and kept a very miniscule piece of it. Can’t wait for 2043!